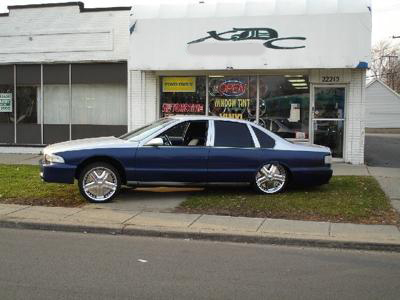 low ride air ride suspension killer paint job and interior and shaved door handles also custom bumpers. I like the two tone paint. It goes good with the body lines of these cars. Whats up with your front bumper cover? It looks kind of square from the side? Do you have any pics of the front? I like the covers you have behind your wheels too. That is 1 clean ride, I Like the paint scheme. The tint, rims, shaved doors and airbags is right at home for the ss. Good job. Post more pics of this ride.